A. Age: 28 until my wedding day, on which I'll turn 29. B. Bed size: Queen because I am one, duh. C. Chore that you hate: Cleaning the stove. I don't know if Wil notices, but every time he asks if I need help in the kitchen, I put him to clean up my mess. D. Dogs: We live in a dog-free building (boo), but are planning on getting a French Bulldog whenever we move again (yay). E. Essential start to your day: iPhoneEmailTwitterInstagramCoffee with coconut milk. F. Favorite color: Green. All kinds. G. Gold or Silver: Silver-colored gold. H. Height: Sixty inches even. Yes, I'm fun-sized. J. Job title: Registered Dietitian. For the love of God, DO NOT call me a nutritionist. I may punch you in the throat. There is a BIG difference. Huge. L. Live: Boogie Down Bronx. 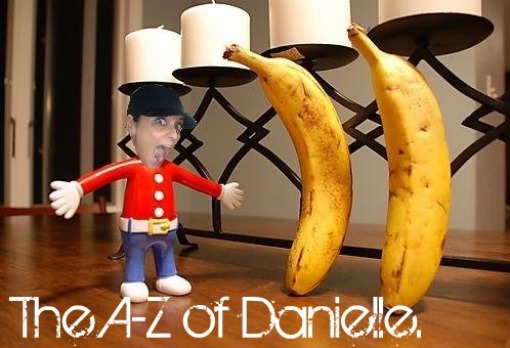 N. Nicknames: Dannie, Dani, D, Dannie C, Shorty D, Babe and Jerk, amongst many others. O. Overnight hospital stays: There were those two times when I almost died. No, I'm not joking and no, I'm not going to get into it right meow. This is a happy place. P. Pet peeves: It really grinds my gears when people put apostrophe's into plural word's, making them possessive for no reason (Ugh, it's hard to even joke around about that). Q. Quote from a movie: "It's only after we've lost everything that we're free to do anything." Tyler Durden of Fight Club. R. Right or left handed: Right is right. S. Siblings: Natalie, Bobby, Sandy and Mario. T. Time you wake up: I get up at stupid o'clock every. single. morning. Seriously, though...I get up at 5:00 on weekdays and if I have to work the weekend (which I do every other week), I wake up at 4:00. Needless to say, I have no social life. V. Vegetable you hate: Beets. They taste like Earth and you know that's the truth! W. What makes you run late: I'm always stealing extra kisses from my Love Cub long after I should be out the door. I have a tendency to get a little grabby, too. X. X-Rays you’ve had: Teeth and toes. Y. Yummy food that you make: All the food I make is yummy, but this is my favorite. Z. Zoo animal: I could spend all day in the monkey house. And now you know everything there is to know about me. If you completed this little meme on your blog, leave the link to your post here. I want to know all about you, too. OMG totally feeling you on the stove thing! Wait, I just realized there's no T! It's "T. Time you wake up: "
I don't know what people have against beets (my sister, the Paper Mama also said she hated them) but I've learned to love them. Actually, they were kind of force fed to me... Hmmm. Maybe I don't really like them.... Actually, they do taste like dirt! But, somehow I've accepted them because I had no choice (livin' in New Zealand. They put them on their burgers).